A Day Late and A Dollar Short: Nascar - Atlanta Motor Speedway - **FREE** Music with Purchase of Program! 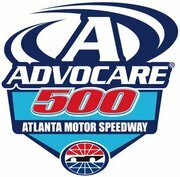 Nascar - Atlanta Motor Speedway - **FREE** Music with Purchase of Program! ...and speaking of Atlanta deals and Nascar...you can get two (2) **FREE** Ernie Haase & Signature Sound song downloads when you purchase a 2011 AdvoCare 500 Souvenir Program during race weekend in Atlanta during Labor Weekend. If you don't know who Ernie Haase & Signature Sound are, you are missing out. 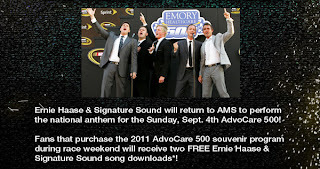 They are a famous Southern Gospel quartet, and they blew the house away last year at Atlanta Motor Speedway ("AMS") with their rendition of the National Anthem. I am so glad AMS invited them back again this year! What a treat. If you missed last year's performance, you can catch it again now by clicking on the video below. Enjoy!